Not so fast. 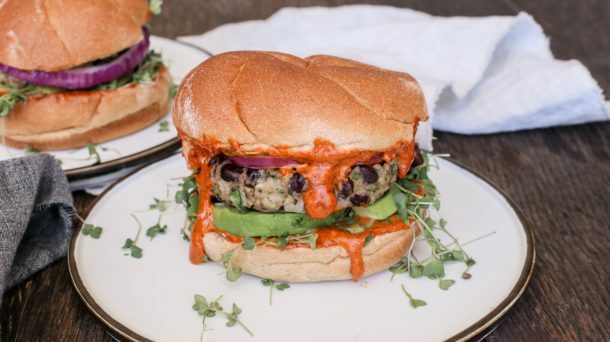 You see “Black Bean Burgers” and you’re already making a run for it? Well, I can’t blame you if your only experience with veggie burgers are those dry, thin hockey pucks in the frozen section of the supermarket. Or if you’ve looked for recipes to make your own at home and the list of ingredients was a page long. What do I have to say to make you give these a try? Would it help if I told you my meat-and-potatoes husband loooooves these? Would you been inclined to make them if you knew that Mr. Picky, yes the one and only, gave these very burgers the thumbs-up? 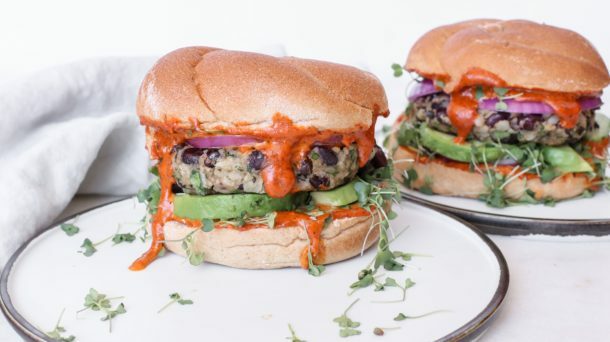 Listen, I’m not guaranteeing anything here, but these black bean burgers are delicious and you’ll want to smear the smoky red pepper sauce on everything from turkey sandwiches to roasted potato wedges to grilled vegetables. Here’s the other thing — can we take a break from meat for 5 minutes? My timing on this isn’t ideal, but Meatless Mondays has some merit. As Mark Bittman said, “Even if you eat a typical American diet replete with processed, junk and fast food the other six days of the week, going meatless on Mondays will still cut your carbon footprint, improve your health and reduce demand for factory-farm meat.” The only thing I would qualify is that going “meatless” doesn’t necessarily imply a more healthful diet. You’re a smart group, and I probably don’t need to tell you that you could eat potato chips and candy bars for dinner and that’s not going to do you any good. But eating a dinner of legumes, whole grains and vegetables can only do you good. it’s as simple as boiling water, if you plan ahead. 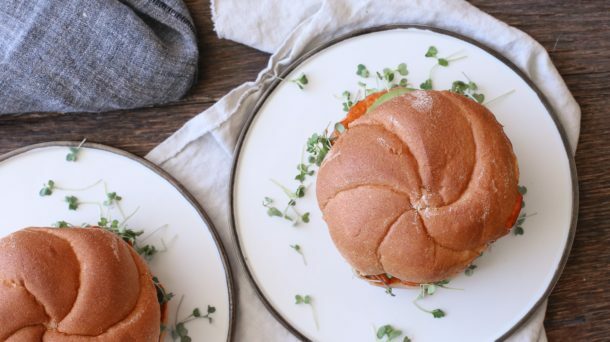 If you are insecure that your family will go for these, just treat them like regular burgers and give them lots of delicious toppings to choose from. In my house, we all put our own spin on them. I eat the burger over a green salad with the pepper spread, grilled onions and sliced avocado. Everyone else takes a toasted bun and adds cheese, ketchup (Mr. Picky), lettuce, tomato, pickles, you get the picture. 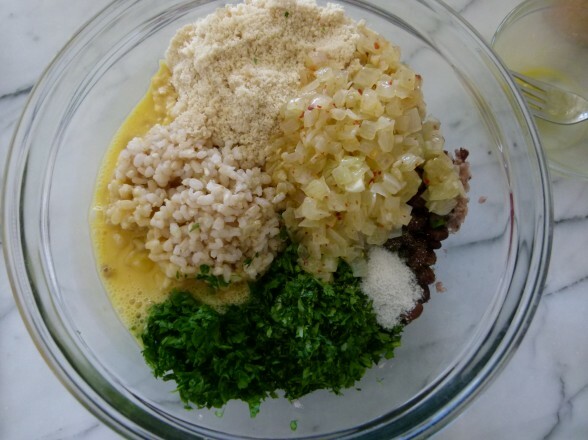 Here’s what’s great for you — you can shape the patties in the morning or even a day or two ahead, pull them out of the fridge right and cook them in less than 10 minutes. Such a great feeling. You can even freeze them and cook them right out of the freezer and just cook them a little longer. I like to fry them on a griddle pan or in a skillet, but you can bake them, too. And — you can make little sliders for a party! That’s all it takes to make me happy, people. In a small skillet, heat the olive oil over medium heat. Add the onion and cook until tender. Add the crushed red pepper and garlic and cook until fragrant, 2 minutes. In a large skillet or on a griddle pan, heat an ⅛ of an inch of oil. Add the patties and cook over medium heat, turning once, until browned and heated through, about 6 minutes. Serve with desired accompaniments. Or preheat an oven to 350 degrees and brush a baking sheet with oil or line it with unbleached parchment paper. Place the patties on the sheet and brush the tops with oil. Bake until heated through and lightly golden brown on top, about 20 minutes. 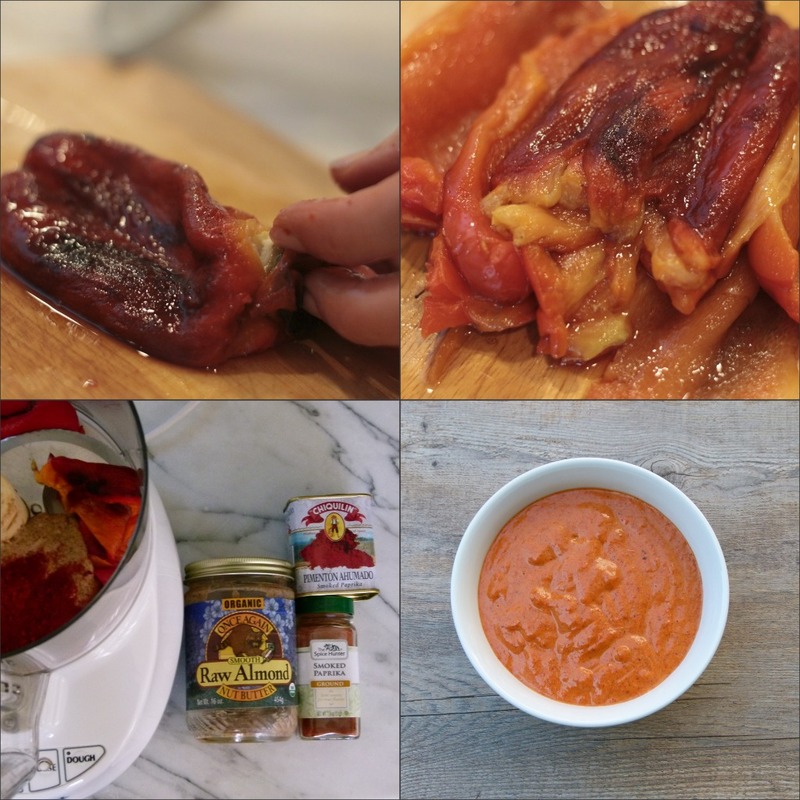 To make smoky red pepper sauce, puree everything in a mini food processor until well blended. 1 pound of dried beans will yield approximately 6 cups of cooked beans. Let's do the math. 1 pound dried costs about $1.00. 6 cups is about 4 cans. 1 can of Eden Organic costs about $2.29. Times 4 equals more than $10.00. Way cheaper to make your own. Place the dried beans in a large bowl or pot and add enough cold water to cover by at least three inches. Allow to sit for 6-8 hours, or overnight. The countertop is fine, but if your kitchen is very warm, stick the beans in the fridge. Drain and rinse the beans in a colander. Transfer beans to a large pot and add enough cold water to cover by three inches. Bring to a boil over high heat and lower to a simmer. Skim any foam off the top while they are cooking. Start testing them after 50 minutes. Cook until tender. 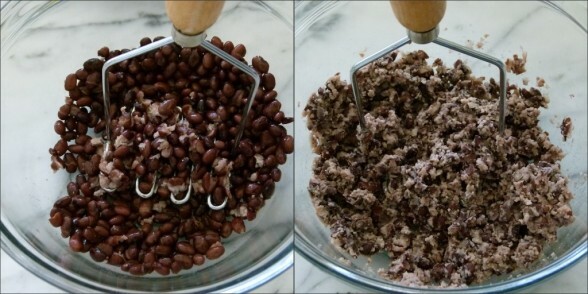 This can take anywhere from 50 minutes to 2 hours (the older the beans, the longer they take.) When they are tender, turn the heat off and add a tablespoon of kosher salt to the water and allow the beans to cool slightly in the cooking liquid. Drain and use immediately or refrigerate and use within 3-4 days. Cooked beans also freeze beautifully. Hi Pamela! Planning on making these in the next couple days. Do you think I could get away with using almond flour instead of almond meal? I used the almond flour and it turned out just fabulous! Thank you! 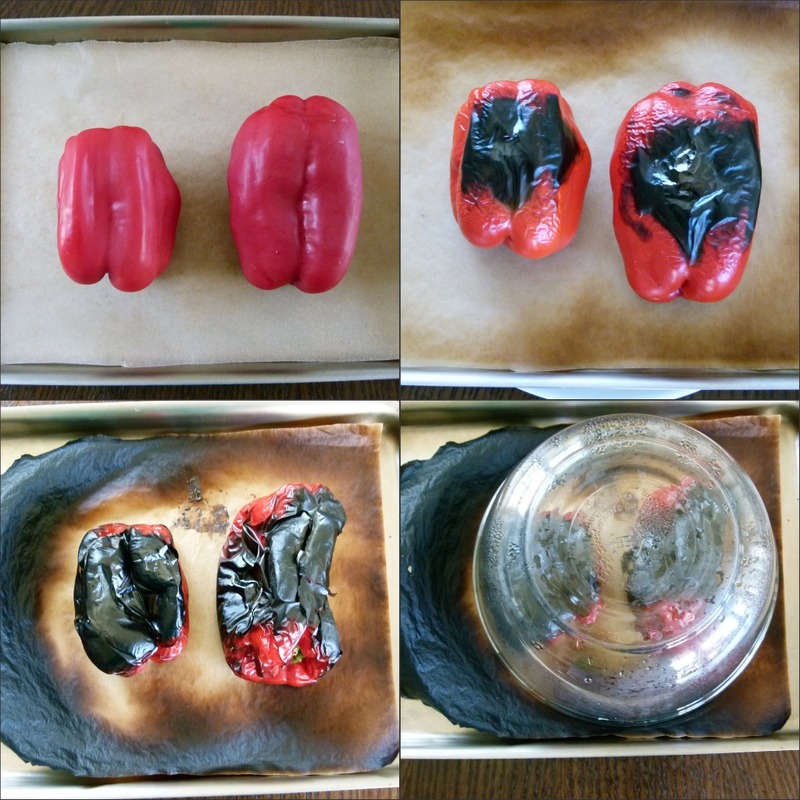 My red pepper sauce a bit nutty…I am guessing becuase I used roasted, no raw. It was no salt added and smooth…had I used raw would I haven oticed a big difference? The raw almond butter is really bland, so I do think it makes a difference. You might try raw cashew butter as well, which tastes like nothing, in my opinion. 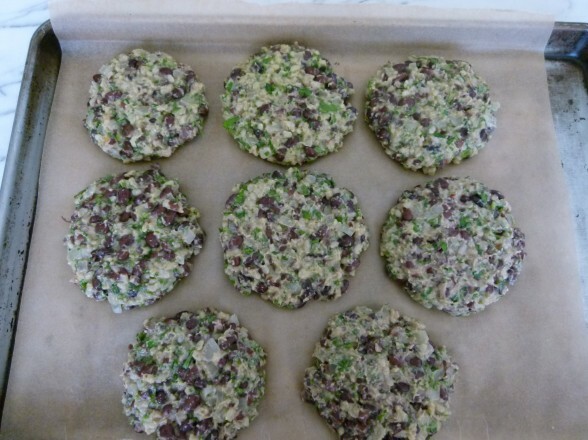 I have been making your dinners weekly and made the black bean burgers last night. There was a lot of grunting and groaning from the kids as they swept in and out of the kitchen wondering what was for dinner. I love it when their expectations are low and I quietly chuckle inside confident they will love it. Well, sure enough, they loved these! I stuffed them in a pita with the roasted red pepper sauce and creamy avocado slaw(which I am obsessed with) and it was amazing! Thank you Pamela! Ahhhhh! This is exactly the kind of feedback I live for! Thank you, Kristin. I am all smiles! I’m a big fan! love these but would like to get them a little crispier. I pan fried them and they weren’t too crispy – is there a way to get a really crispy crust on them? You need to make sure the heat is hot enough when you put the burgers down and don’t use too much oil otherwise they’ll get soggy, especially if the heat isn’t hot enough. I hope that helps! I’m feeling like I need to make this sauce for something right now. Love it! 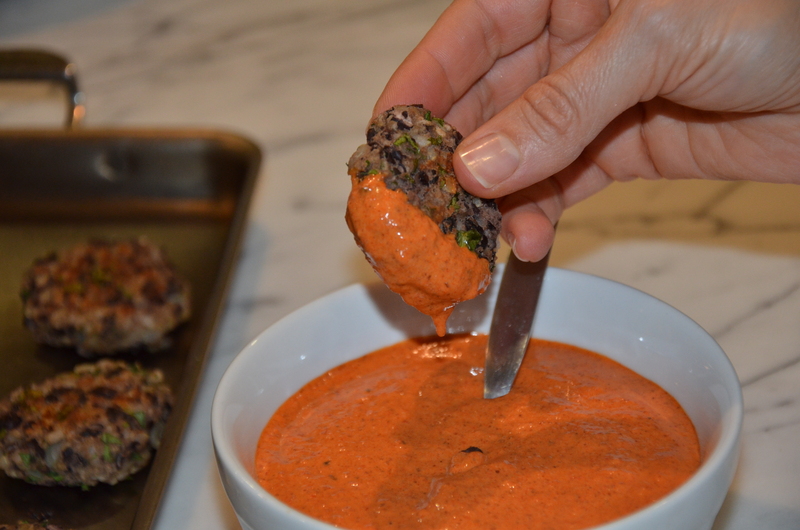 I finally made these burgers and red pepper sauce, and they are both DELICIOUS!!! They will absolutely become a staple around our house. i love the make ahead and freeze option too. Since they are so delicious, and we are hosting a vegetarian couple for a dinner party, I will serve these, but can you recommend a hearty salad to compliment them and the red pepper sauce? Using eggs is unhealthful, more cruel to the short lives of the chickens, and not environmentally sound. The male chicks are tossed in the trash, the females live in stacked crates for the 4 miserable months of their lives, with the lights on 24-hrs, the waste is an environmental disaster and in addition to eating animal protein, saturated fat, antibiotics, high levels os pesticides from the chicken feed, you are more likely than not to have salmonella in there. Try these burgers. I love them! And I agree about the sauce — so good with sweet potatoes, regular potatoes, frittata, turkey sandwich…. Pam, these are amazing and I tried a couple other recipes and this is by far these have a better texture and taste. I’m wondering if I can substitute the brown rice with quinoa … and would that be like for like in quantity ? Also, love the red pepper sauce! I love that red pepper sauce, too! I think you probably could sub quinoa 1 for 1 with the rice, although I haven’t tried it. I know for sure the recipe works with farro and barley, however those aren’t gluten-free if that matters. Let me know if you try the quinoa. Made these for dinner tonight and held my breath as my picky one took a bite. He declared it “not bad”- high praise from him. The rest of us loved them! And the sauce is so good I ate it by the spoonful. I cooked these straight out of the freezer and they were great. Really funny! Thanks for sharing. Also so helpful for everyone to know you can pull them out of the freezer for an instant dinner. Total hit in the household I nanny for! Even the dad who NEVER tries anything new liked the burger! Funny, Leslie! Good to hear. My husband surprised me, too! I made theBlack Bean Burger Patties for dinner tonight without any egg and it still turned out great. I even made mini burgers or sliders for the girls and they are loving it. I made the Smoky red pepper sauce, but changed the ingredients a little. I added Vegan Sour Cream instead of the almond butter, along with the roaster red pepper, and smoked paprika. It tastes really good and you can’t even tell it is vegan. Thank’s Pam for the recipe. I have a plethora of red peppers to harvest from my 2 plants I grew because of your great influence!!Smile! If I make lots of this yummy sauce: 1)how long will it keep fresh in the fridge? 2)would it freeze in small batches to enjoy during the winter? What would the technique be to cook beans in crock pot since I work at school and gone all day? Oooh — red peppers from the garden! Excellent. I have had the sauce last a week, in a tightly covered container in the refrigerator. I have not frozen it, but I don’t see why it wouldn’t work. Please let me know if you try it. Did I miss this class? I’m running to the store and making these tonight! Thanks Pamela!! August vegetarian class! I think you’re going to love them. This recipe is destined to become one of my favorites. Thanks for sharing…you are awesome for encouraging nutritional evolvement. “Nutritional evolvement” — I love that! And yes, you will adore the burgers. Enjoy! I have made these a few times because I finally found a meal my entire family LOVES! I even make them egg-free for my almost 2 year old and he cleans his plate:) I have made them with egg replacer and have also just eliminated the egg. Both work, just make sure you refridgerate them as the recipe calls for, because it makes them easier to cook. Thank you, Sharla! I never got around to testing these without eggs. All the vegans and egg allergies out there are happy to hear this. Did you use actual “Egg Replacer” or ground flax ” egg.” Just curious. I want to try these out and love them. I’ve tried so many vegan burgers but have yet to make any a second time. These look and sound yummy! I’ve never used an egg replacer. I’m sure a flax egg would do the job. I made this for my family and company recently and so I made regular beef burgers and the bean burgers to give them a choice. Of course my boys went for the beef and my husband and a few others went for the bean, but half way thru the dinner, the boys asked for a taste and then gobbled it up. They LOVED the special sauce. Great idea. I didn’t have time to roast a red pepper, but I happened to have a jar in my pantry, so I was uber happy that I could whip it up! Thanks!!! Those boys! Happy to hear they were open-minded enough to give the patties a try….and liked them!